I think I’ve told the story here of how I started writing historical fiction. I was reading a nonfiction book about the 1913 Suffrage March in Washington, D.C. I read a scene about the march and knew, instantly, that I wanted to write a hero who was part of that scene. Of course, that turned out, eventually, to be the other book I still have to write, but still…that was my entry into a genre I never thought I’d be part of. And I learned something else. For me, history is people. Not wars, not political parties, not socio-economic statistics. People. Individuals. Yes, sure, I’ll read about the impact those people had on their times, and the impact their times had on those people. But if you don’t catch me with how the person actually ticked, how they thought and how they behaved…well, you won’t catch me. Which, hey!, fits pretty well into writing historical fiction. Because, again, fiction for me is about people. Aka characters. How they act, why they act, and how they interact with/off each other. This weekend, I wrote a scene, in which the people of history and the people of my story finally came together. There is really one reason why the book I thought I was working on has been put in second place on the writing shelf. That reason is Jane Addams. When I started reading about Chicago in the early 1900s, I was so blown away by how Addams was everywhere, doing everything, and by the person everybody and their great-nephew’s-cousin’s-sister-in-law described her to be, that I was lost. Or maybe found. 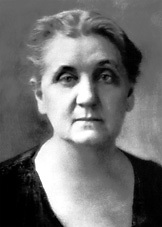 But I haven’t been sure whether I would really write Jane Addams into my book. It’s the story of a teenage girl, the daughter of an immigrant mother who lives her live in a too-narrow world of fear. The girl finds Hull-House, finds the world that the settlement residents move in every day, and has to break out of her mother’s shell to become part of the settlement life. Anyhoo…Like I was saying, I knew that Hull-House would play a big part in the story. Huge. But by 1910, Jane Addams wasn’t always around Hull-House. She traveled, she spoke, she had a finger in just about every pie inside and outside the United States, let alone Chicago. And I didn’t want to force her in, just to give her the cameo. But Saturday, she stopped by. Just like she did so many times in real life, dropping into a class that was being taught for a few immigrant girls, in one of the many Hull-House rooms that were always full and busy. She talked to the girls, she stayed to help, and then she was drawn away by another resident with another demand on her time. All with grace, warmth, and ease. I think I got close. I think I may have painted a TRUE picture of who this woman was, who I see her to have been. A woman who always had time for her neighbors, for the people who were the reason she built a Settlement House, the reason she settled onto Halsted Street in Chicago, in 1897. A woman whom people not only respected and admired, but truly loved. And I think, after all, she may very well stay in this story. Oh that is very cool! You must be thrilled that she showed up! I love when this sort of thing happens. I am thrilled. I did plot her a spot, but because it felt right, and then it felt REALLY right! Thanks for the lovely shout-out, Becky! Jane Addams is one of my heroes, and I love that she turned up in your chapter in ways that both surprised you and felt true. Moments like that can bring the past very close. Yes, much better that she showed up on her own instead of being forced in! Great to hear that someone is trying to put the people in history. That’s exactly why I write the type of thing I do. Unlike many (including you, I see from the post) I enjoyed history because, even though the education system did its best to ruin it, I could ‘see’ some of what the featured characters (Champlain, Columbus, MacKenzie) probably did as people even though that wasn’t included in the classes. So I write stories that do not follow the accepted (replace with BS) presentation of history but I try to include historical facts in each story.